There was a time when scuba diving was considered a dangerous and physically demanding activity. But today, things have changed, all thanks to the advancement in scuba gear and equipment. The use of sophisticated gadgets like dive computers, refined dive plans, and proper understanding of the activity itself have made scuba diving easier and safer than it used to be. Almost everyone can learn how to dive. But there are some restrictions in scuba diving, and one of these is age. Whether or not a person is too old or too young to dive has always been a topic of discussion. So in this post we look at age as one of the most important requirements for scuba diving to help you understand the perfect time in life to get started with dive lessons. Someone once said that age is just but a number, and that we all are as old as we feel. Can you remember those days when you wake up feeling all energized and full of enthusiasm? Other days you wake up bored and feeling so negative and crappy that you get thinking, “Good heavens, am I 100 years already”? What we are trying to say is, no one is too old to go scuba diving. If you are 60 years old and still feel like you can carry the weight of a scuba tank, and slip into your wet suit just fine, you can take scuba diving lessons. But wait, scuba diving has a minimum age, which happens to be 8 years. If you are 7 and reading this (which we doubt), sorry, you got to wait a little bit more to play in the underwater gardens. Most diving organizations will offer special courses for kids aged 8 years and above in shallow, monitored conditions and allow those aged 10 years and over to take open water diving certification courses. However, in the US, most diving organizations require children to be at least 12 years of age before enrolling in a certification course. So, Are You Physically And Mentally Fit For Scuba Diving? Currently, there are no scuba diving age limits for older people. However, if you are 45 years and older, you will need to make sure that you are healthy both mentally and physically. A medical examination can tell you whether you are fit to enroll in scuba diving courses or not. Before you begin the course, you will be required to answer a medical questionnaire that will determine whether you are physically fit for diving or not. The high pressure experienced underwater affects how a diver’s body functions. A health condition may not be noticeable or bothersome in everyday life but could turn life threatening underwater. Asthma, collapsed lungs or any other respiratory system problems could be a potential danger underwater. Problems with ear equalization could also put you at risk of conditions like ear barotrauma and vertigo, not forgetting allergies and certain cardiovascular diseases. Most diving questionnaires, for instance will ask those who are above 45 years old to give information about their lifestyle habits, cholesterol levels and family history of cardiovascular diseases. Acknowledging any of the medical conditions listed on the questionnaire means that you can’t take diving classes without a written consent from a physician. Health is a major factor in scuba diving requirements. So, make sure to answer the medical questionnaire honestly before you begin to dive, and review it regularly throughout your diving career. One of the reasons why scuba diving at an older age was once disapproved is that experts previously thought that older divers would not be able to cope with the pressure changes underwater due to the general decline of their lungs over time. Scientists particularly argued that lungs of elderly divers would retain a dangerous amount of carbon dioxide, which could affect their breathing underwater. However, studies were later conducted and showed that older divers retain the same amount of gas as younger divers. And thanks to modern diving equipment, most of the problems associated with senior divers can be mitigated too. For instance, vulnerability to hypothermia can now be reduced by wearing a dry suit and staying warm while scuba diving. Poor vision can be resolved by using prescription scuba masks or contact lenses. Scuba diving age limits for older divers are being scrapped off slowly by slowly and many countries are now allowing the elderly to learn the spot as an effective way of exercising. How About People With Disabilities? Disability is not inability, and yes, you can dive with it. Today, there are scuba diving agencies that offer courses entirely for people with a physical disadvantage. This type of diving is commonly known as adaptive diving and has become increasingly popular in recent years. Adaptive scuba diving equipment has been developed to cater to those who may face challenges using the normal dive gear. For instance, there are webbed gloves today for divers who can’t use scuba fins. Do you need to know how to swim to scuba dive? Surprisingly, being a pro swimmer is not listed among the top scuba diving requirements. However, you need to be comfortable in the water. You should not be terrified to an extent that you can’t even stand in the deeper end of the pool. To enroll in scuba diving courses, all you need is to be comfortable and at ease while in the water. But to earn a certification, you will have to pass a watermanship test, which varies based on the organization and level of certification. Though age comes with potential health implications, it doesn’t determine who gets to learn scuba diving and who does not. 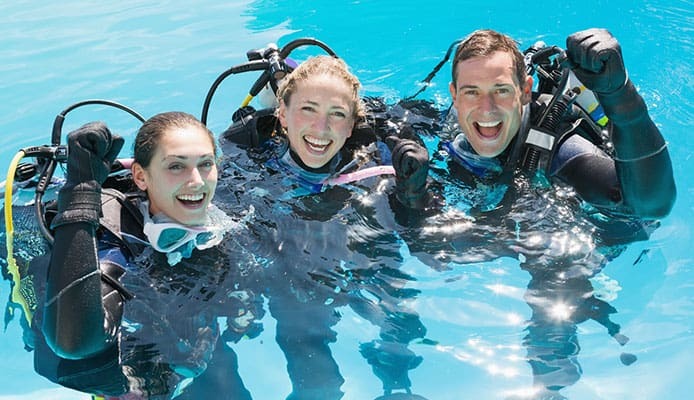 As long as you are physically and mentally fit and pass all the requested medical questionnaires, you should be able to enroll in a dive course. Similarly, as long as you maintain the required fitness level and go for regular health checkups, you have no reason not to continue enjoying scuba diving for as long as you wish. My name is David Hamburg. I am an avid water sports fan who enjoys paddle boarding, surfing, scuba diving, and kite surfing. Anything with a board or chance I can get in the water I love! I am such a big fan I decided to start this website to review all my favorite products and some others. Hope you enjoy! Your #1 Source For Paddle Boards, Kayaks and Water Sports Reviews, In One Place.